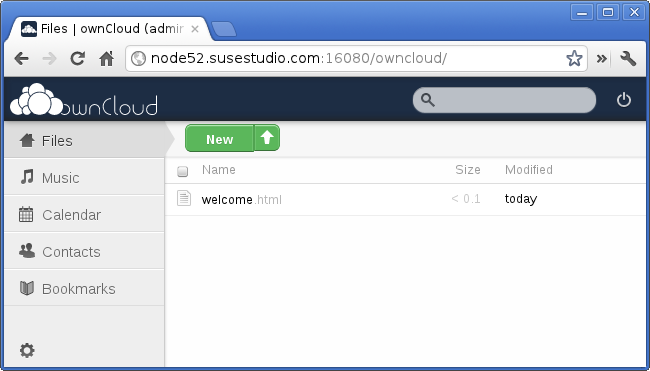 I got distracted by Linuxtag, but finally got around to release ownCloud in a box based on the ownCloud 4 release now. Go and download ownCloud as aplliance in your favorite format now. It's based on the latest ownCloud 4.0.0 release. For this release I added two new formats, one is Xen, and the other one is OVF, which can be used to run it on VMware ESX. The other formats such as virtual disks for KVM, VirtualBox, Amazon's EC2 and other hypervisors as well as the live images for CDs and USB sticks, or the disk image and the Preload ISO for installation on physical hardware are of course still around. When you run the appliance in a publicly accessible way, make sure you change the password of the system and ownCloud users. If you use the syncing client, you should also make sure that the machine runs with the correct time, as the syncing algorithm relies on client and server to have the same time. Setting up encrypted access via https needs the usual configuration of Apache and uploading of a certificate. If you run ownCloud outside your private network and you have private data on your server, this is an advisable step. It's nice to see all the great progress in ownCloud. But for those who are on the conservative side, there are still the appliances with previous versions around, so you can run proven versions, while you evaluate the new ones. Choose one from the column on the of the ownCloud in a box page.